I've just raced through the third book in the Julia Probyn series. I'm completely addicted to Ann Bridge & I can't thank Bloomsbury Reader enough for bringing her books back into print. I'm even downloading non-Julia Probyn books even when there's no synopsis & I have no idea what they're about. That's the definition of true addiction for me. Bloomsbury have just completed the Julia Probyn series by releasing The Episode at Toledo (the further adventures of Hetta from The Portuguese Escape) & I've also downloaded The Tightening String & Enchanter's Nightshade. If anyone has read these & can tell me what they're about, I'd love to know. The Numbered Account is set in Switzerland. Julia goes to Switzerland to accompany her great friend Mary Hathaway's maid, Watkins. Mrs Hathaway is ill & staying with a friend. She wants to relieve his household of the burden of her care & Julia agrees to take Watkins, a nervous traveller, out to Switzerland to look after her. When her cousin, Colin Munro, hears about her trip, he asks her to look into a little problem of his own. His fiancée, Aglaia Armitage, has just become a wealthy heiress after the death of her grandfather, Greek tycoon, Orestes Thalassides. His money is safely stowed away in a numbered account in a Swiss bank & can only be accessed by a representative with the appropriate documentation & bona fides. Mr Thalassides' will is a little vague as to his intentions & Aglaia's mother has just sent her on a trip to South America so Julia agrees to visit Aglaia's godfather, a Swiss pastor, get all the necessary passwords & retrieve Aglaia's money. Of course, it's not that simple. Julia has no trouble with the Swiss pastor but on her way, she discovers that a girl impersonating Aglaia, along with two men calling themselves her godfather & fiancé are also on their way to dupe the bank out of the money. Blueprints for a top secret & very valuable oil transportation system are also at stake & soon British Intelligence are involved as well as the imposters & some very sinister Germans. When the bank hands over the money & the blueprints to the imposters, Julia is soon on the trail, befriending the false Miss Armitage & crossing swords with John Antrobus, British Intelligence's man on the spot. This is another exciting adventure set in an exotic location & I loved it. 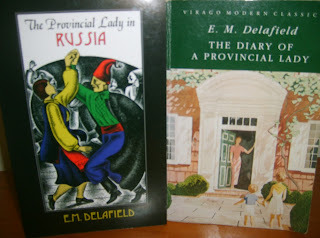 Julia visits Aglaia's godfather in his idyllic country parsonage, picks wildflowers on mountainsides with Antrobus, rides a funicular railway to a mountaintop & sweet talks her way in & out of several very tricky situations. In a way, the locations are the real stars of this series. Ann Bridge must have been a great observer on her travels as she makes the countries she writes about come alive. Julia is her usual supremely confident self, although her personal vanity takes a hit when she meets her match in John Antrobus. As a lover of all things Scottish, I'm especially looking forward to the next Julia Probyn adventure, The Dangerous Islands, set on the west coast & islands of Scotland. My dilemma is, do I just gulp the whole series down by Christmas or should I try to make them last all summer? I do have those unknown Ann Bridge novels to look forward to & there's always the chance that there will be more to come, including, fingers crossed, Illyrian Spring? Decisions, decisions! 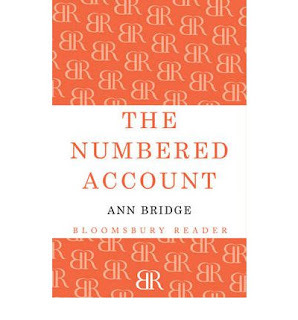 There's a copy of The Numbered Account available to buy at Anglophile Books. I haven't read any of the Julia Probyn books but I did read Illyrian Spring (via the college library, not my own copy) and I found a Capuchin edition of Peking Picnic at the Borders blowout! The college library has a lot of her books so I should look for them, since I don't do e-readers and the paperbacks won't be out for another year. Ooh, Illyrian Spring was wonderful! Book Snob was kind enough to send me a copy as part of her crusade to spread the word and hopefully inspire a reissue. Don't let that title pass you by, Lyn. Karen, I think you'd enjoy the Julia Probyns. They're light reads but the locations are beautifully described & Julia is a very appealing character. Perfect summer reading - well, for me, anyway! Perfect holiday reading, I should say for my friends in the northern hemisphere. Darlene, I am longing to read IS. Miranda from Bloomsbury Reader (who kindly tweets about my reviews) has promised to look into reprinting it. Thanks for your review Lyn, I have nearly finished Portuguese Escape and have The Numbered Accountant ready to go. Am longing to visit Portugal as well as Morroco now. I found Hetta a wee bit annoying in Portuguese Escape - a bit virtuous. But on the whole I think it was a better organised novel than The Lighhearted Quest which made me a bit dizzy with all those villans,locations and expats getting a little bit muddled in my tired brain at 11pm. Ann Bridge is such a skillful prose writer. I have also been reading The Matchmaker by Stella Gibbons and it is nowhere near as accomplished. I've got the first one lined up now, ready to go. Looking forward to it immensely, as I wondered what I could possibly find to replace Mary Stewart in my life. Merenia, I agree that the plots move at lightning speed but that's what I like about them. I just get swept along. I'm looking forward to Dangerous Islands next, set in Scotland. Bibliolathas, I hope you enjoy it. I think she's very similar to Mary Stewart so an 8 book series should keep you going for a while if Julia is your cup of tea. Linda, you'd especially enjoy The Dangerous Islands, set in Scotland, the west coast, I think. Still, if you're a Mary Stewart fan, you'll probably enjoy all AB's exotic locations.